Artistically impressive and often funny, the movie still manages to be relatively boring and go nowhere due to it’s limited story ideas. 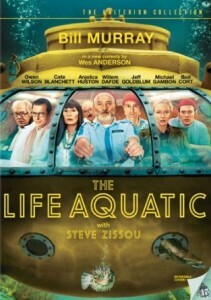 The Life Aquatic with steve zissou is an interesting movie in the sense that it looks great but feels lousy. I used to think a comedy could get by without a great plot, just as long as it was funny. this is the movie that proves that theory wrong. the humor is there. the colors and artistry of it all are definitely there. but the plot has such a limited amount of ideas that the movie ends up with low energy and feels like it loses steam more and more as it goes on. the plot is really very simple. there’s this guy, steve zissou, who explores ocean life much like the real jacques cousteau. Zissou and his team of “scientists,” make documentaries when they are out at sea, and they need financing to have money for their voyages and their movies. Every wes anderson movie has a character like this, immature and selfish, in a black comedy-ridiculous kind of way. sometimes there’s even more than one. and the main one, who the movie is always based around, tends to be a father figure. in the royal tenenbaums that was royal himself (gene hacckman), dying father trying to make up for never being there for his kids. in rushmore, it was herman blume (bill murray), finding max and his wacky ideas not only fascinating, but worth financing and pursuing. And in bottle rocket and the darjeeling limited, it was the owen wilson character, maybe not a father, like in the other movies, but still either the leader of a gang, or the one looking out for his younger brothers. the formula usually works. anderson comes up with some very funny ideas and ways to make his character do things without them even realizing how they sounds or how selfish what they say and do is. 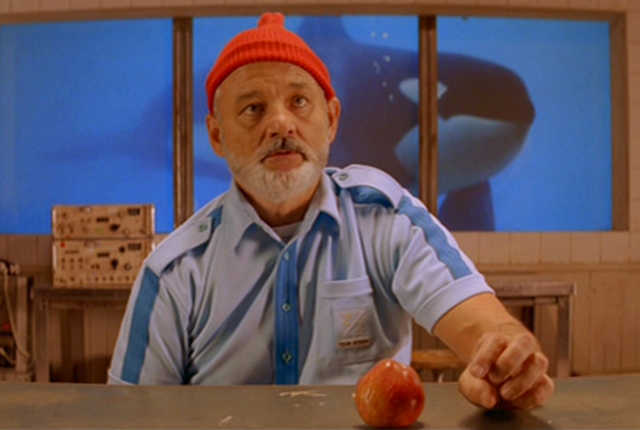 the pattern works in this movie, The Life Aquatic, too. the problem is, not much else does. the story has these plot points, like “we’re going after the jaguar shark,” but it doesn’t in any way provide a clear path for getting there. these guys don’t actually track the jaguar shark and follow clues, the way a detective might, they’re just happy to be at sea. it’s almost as if the jaguar shark is only an excuse to get them out there, because once they get out there, they’re gonna relax and enjoy themselves. Aside from the jaguar shark, there are two other things going on here. the first is that owen wilson shows up at one of zissou’s public forum’s and declares himself the son of the oceanographer. zissou accepts wilson and takes him under his wing, and even invites him to come on their next voyage. and wilson agrees. that leads to a lot of “are you really my dad?” questions. none of them are all that interesting. the other additional plot point is that a pregnant australian reporter (cate blanchet) comes on board the ship with them to tell their story. she reads to her baby in her stomach at night and wilson’s character, ned, sits next to her to listen to her read. it seems obvious that it’s only a matter of time before these two get together. and they do. this movie really didn’t have a direct story path. it had a handful of ideas, mostly about who the characters would be, and it hoped that a story would just naturally form from those ideas. there were two things that seemed obvious from very early on. one was that ned and the reporter would get together. he was so nice and innocent and fascinated with her, and seemed like a really decent guy. the other was that by the end of the movie, the crew would find the jaguar shark. other than that, the ideas were very limited. they were all sporadic and unrelated to each other. so for example, the crew decides to break in and steal from jeff goldblum’s marine facility at sea. and in another scene, they are attacked by pirates who board their ship and kidnap one of their crew members. all of it could have been a lot more exciting if it was what the movie was mainly about. but instead, these scenes are treated just like any other moments of the story, a series of unrelated events, over and done with quickly as the movie moves on to other things. as always, wes anderson is a master of color palettes and in finding the humor in both colors and dialogue. here, his characters look ridiculous in their bright red caps and light blue speedo wetsuits. anderson is a filmmaker with style and he shows it by finding fun and creative shots throughout the movie, like a tracking shot that follows two arguing characters from room to room through about ten different rooms on the ship, spanning multiple decks. But the plot seems unfocused and all over the place. a main character dies, for example, and there’s no setup before or consequences afterwards. such a key moment should have been setup from the very beginning and then treated with more tension and excitement when it occurred. the movie definitely has humor, but it’s unstructured plot makes it feel like it just goes on and on with no ending in sight.